Well hello there! Today I have a bit of a two for the price of one deal for you all. It just so happens that I wasn’t able to get my October Menu up and over the weekend. 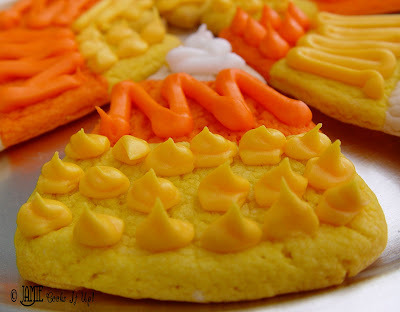 And it just so happens that I made these fun cookies on Sunday night and really couldn’t wait to get them posted. So….two posts in one. A little Menu action with a little Cookie action mixed right in. Here is my October Menu. The recipes that show up as links are fabulous meals I have posted in the past, the ones in black are recipes I hope to post in the future. Keep on a scrollin’ for the cookie instructions. Just a word about these cookies. They are TASTY!!!! and so fun to make. I decorated the first few and then let my kids loose to do the rest. They had a great time! Hope you give them a try. We are entering the baking season everyone! 1. Mix all cookie ingredients (except the food coloring!) in a stand mixer, or with a wooden spoon until nicely combined. 2. 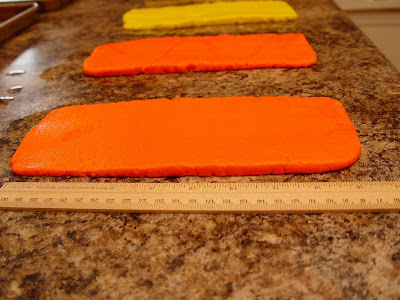 With a rolling pin roll each section (you should have 6 now, 2 of each color) into a rectangle. 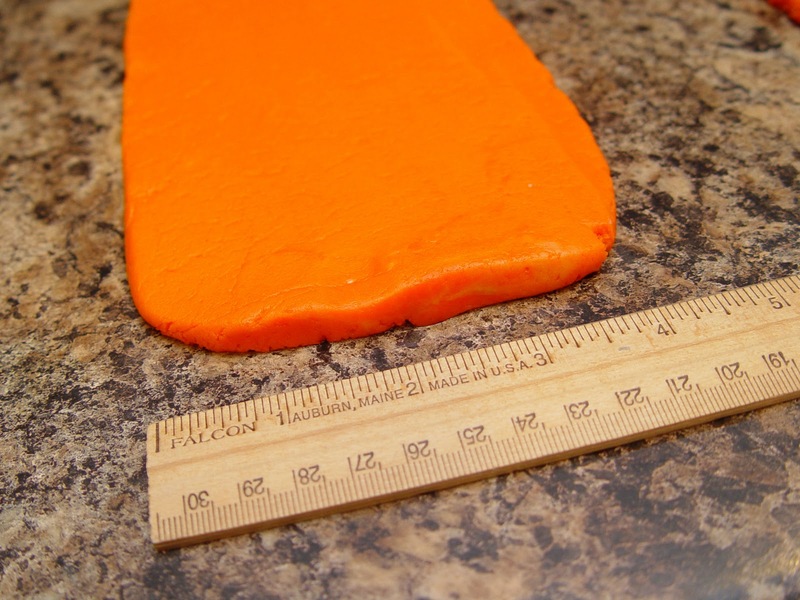 Mine were about 9 inches long…..
…..and 4 inches wide. Now, you don’t need to be this exact. The most important thing is that all of the sections are rolled out to be about the same size. Don’t worry about it being perfect. Perfect is EXTREMELY overrated and not very fun, actually. 4. 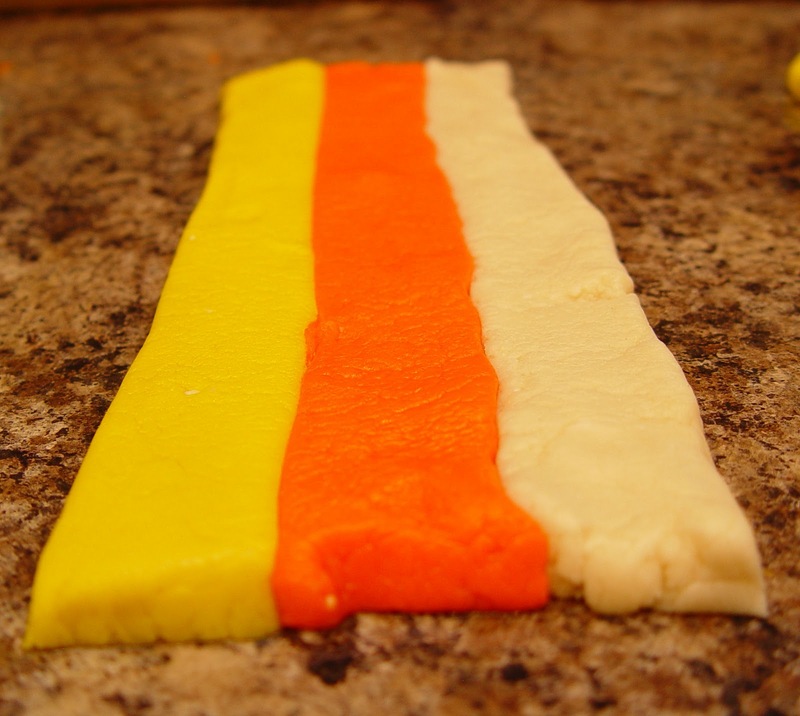 Gently place a yellow, orange and white strip of dough together. 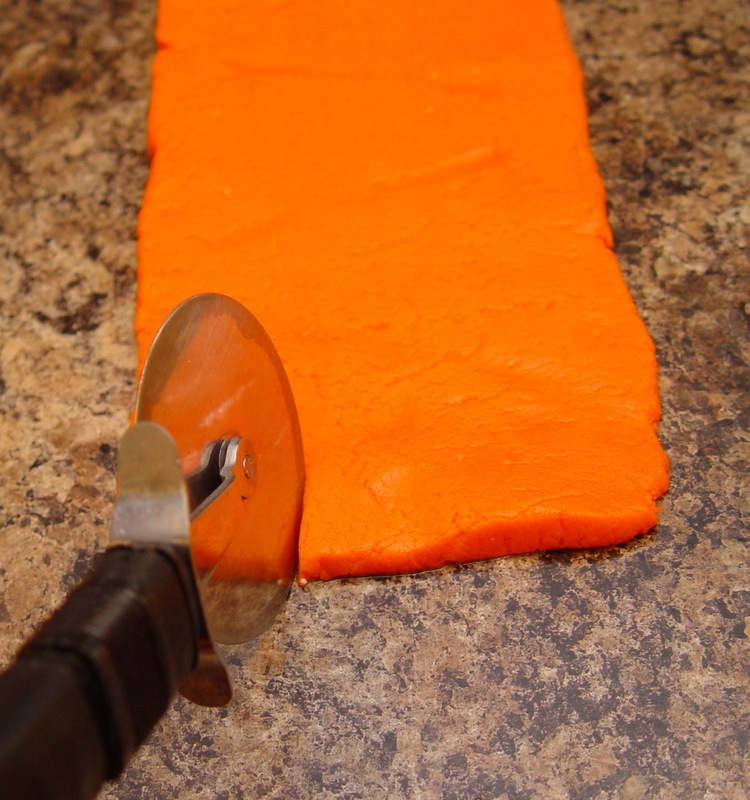 Press the seams down a bit with your fingers so they begin to stick. Again with the “they don’t need to be perfect.” If the strips break a bit while you are moving them around, don’t sweat it! Just press them back together and all will be well. You can see here that there are two little triangles left at each end. I actually ended up rolling these into balls and baking them as round cookies. You could do that, or just eat the dough. Or just bake some small triangles. What ever suits your fancy. 6. Gently place each cookie on a cookie sheet. 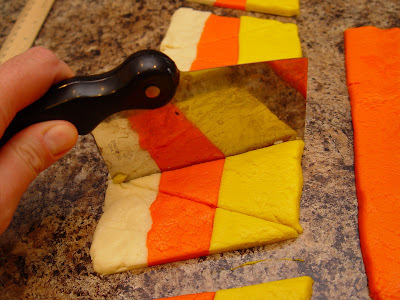 I used a spatula, slipping it under each triangle to help assist it to the sheet. Some of them came a part just a bit, but no worries! Just press the seams back together on the sheet. The baking really helps to fuse them together. 7. Bake at 350 for 8 minutes. (For Convection Ovens bake at 325 for 6 1/2 minutes.) 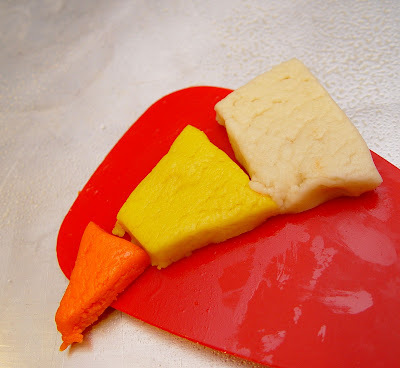 Let them cool completely on a wire rack before frosting. 1. In a stand mixer, or with hand held beaters mix all frosting ingredients excepting the food coloring. Beat it well! You want it to have a bit of a whipped feel to it. 3. Place each color in it’s own zip lock bag and tie the top with a twist tie. 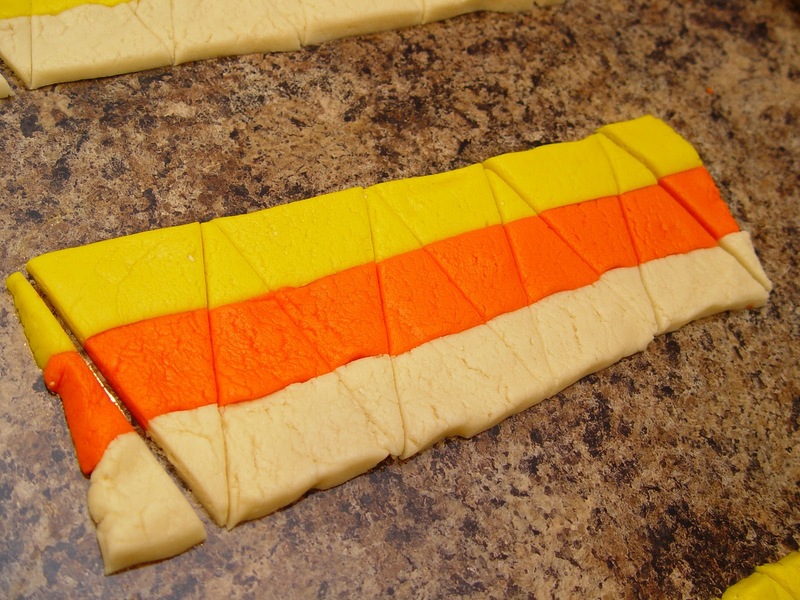 Cut a small tip in the end and decorate your cookies as desired! The October menu looks so good! And the cookies do too!! 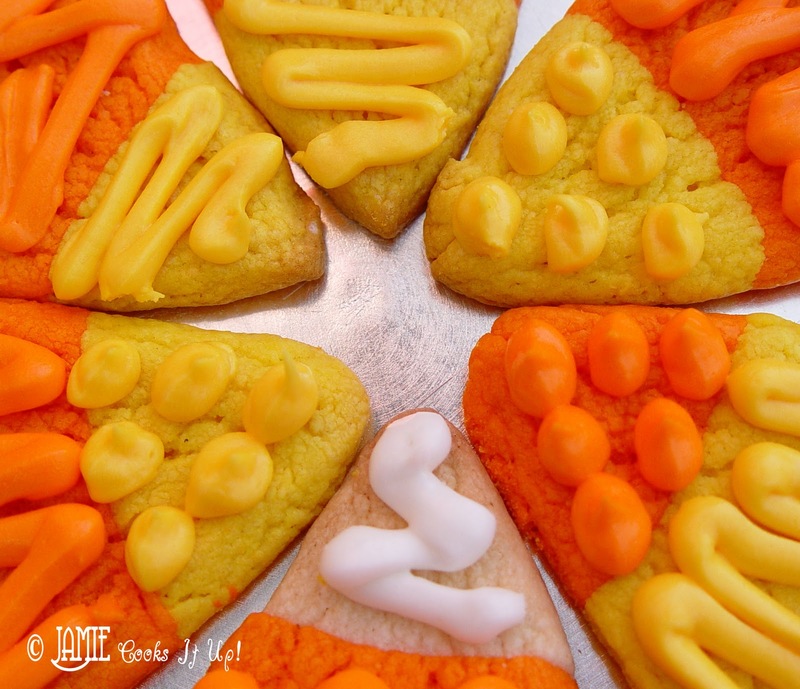 I'm a total candy corn fan so will definitely give them a try!! I made candy corn coookies last year but they were not frosted. I really need to make them again. You menu looks awesome as usual. These turned out absolutely darling! Truly adorable. And since I'm not a big fan of actual candy corn, I would much prefer these cookies instead. Your menu sounds delicious. I can't wait for some of those recipes. My mother in law made your taco soup on Saturday and it was so good. Thank you. Those cookies look so good too. I can't wait to try them. Thank you. How is the hillside holding up with with rain? I hope you don't get a mudslide to top off all the ash and smoke you had to deal with. These are so fun! I really need to get into the kitchen now. Great menu ideas! I am so excited that cooler weather is here(I hope! ), so I can pull out my arsenal of soup and stew recipes. The baking bug always bites in the behind this time of year, which is not good for my pre holiday waistline! Stretchy pants, anyone? Tori, so glad the Taco Soup was a hit! We are doing fine here…the rain hasn't been too bad. Thanks for asking. Have a great day! These cookies are SO cute! I am in the middle of making them now. Just a question, is the dough supposed to be sticky? yours doesn't in the pictures and mine is sticky. I have added a little extra flour but it hasn't helped. Should I refrigerate it?? I would wrap your dough up in plastic wrap and throw it in the freezer for just a bit. Maybe an hour or so. You should be ok after that. I wondered if I would need to regrigerate my dough, but it ended up being fine. 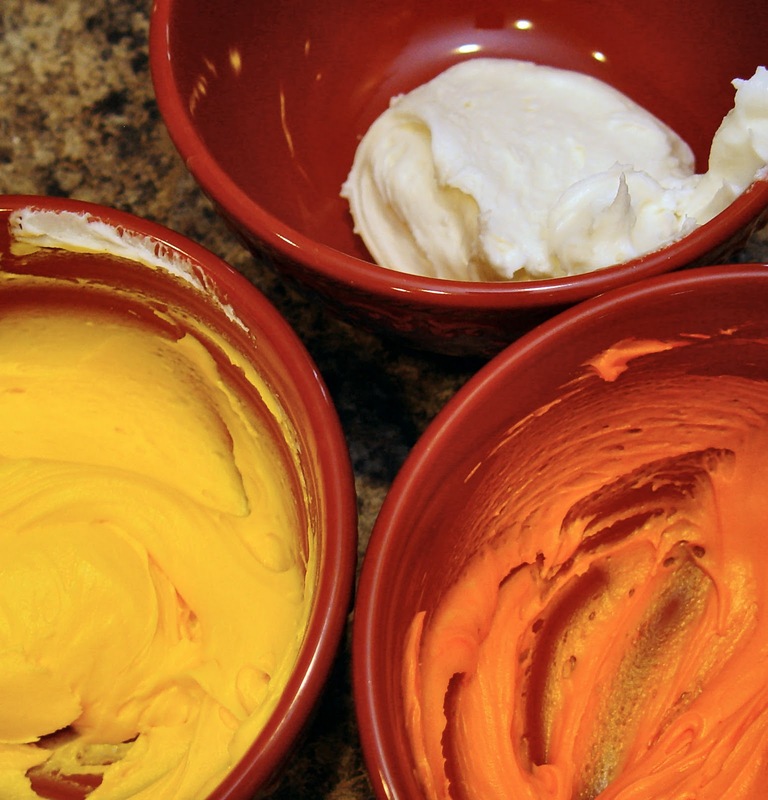 What brand of cake mix did you use? Sometimes Duncan Hines is a little bit more substantial than Betty Crocker or a generic brand. Maybe that is the trouble. Let me know how it goes! Good luck! I love the color of the cookies they are very colorful. They are so cute! Love to bite them! We own a Wall Mirrors ecommerce site and are always looking for great content to share and help inspire. Thanks. The cookies were fun to make and turned out cute, but they are way too sweet to eat. We decided not to frost. 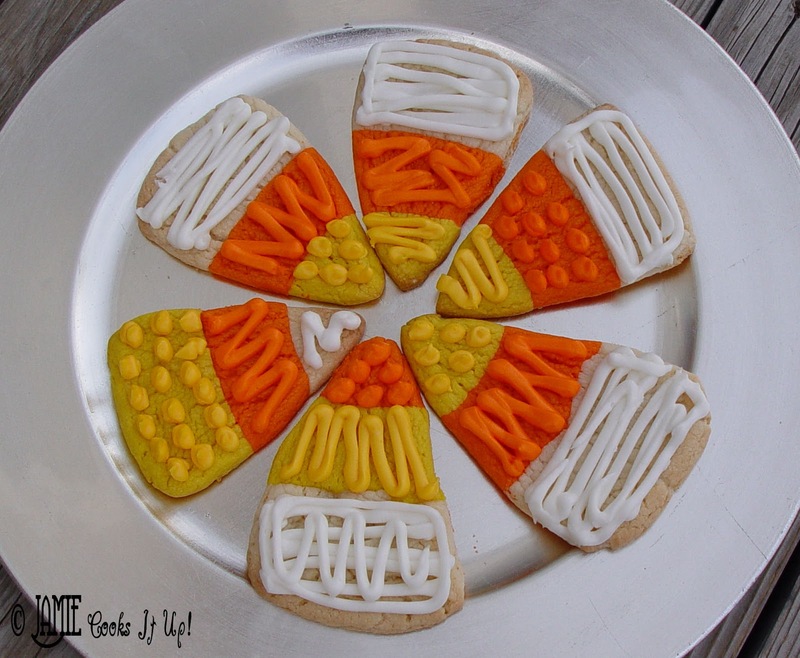 I suggest the same idea but with regular sugar cookie dough. The cookies looks very colorful! Love the looks! Kids definitely love it! 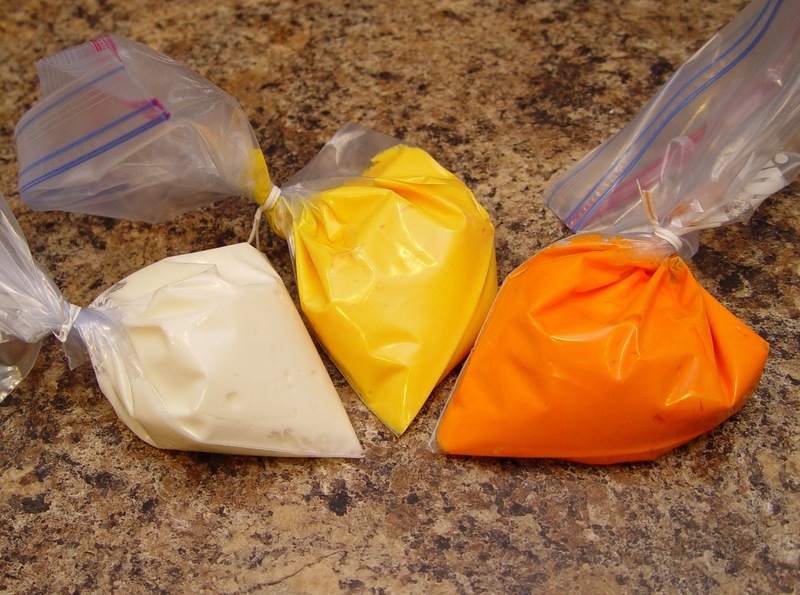 Would liquid food coloring be okay instead of the food coloring gel? or would it ruin the consistency of the dough?